Today I'm thrilled to welcome Rosemary (Romi) Hill to our blog. Romi designed the Talmadge Cloche for this month's project for A Year of Techniques, and she is well known for her beautiful lace designs. She has generously donated a prize for a blog reader, so do read down to find out more. JAC: Romi, thank you so much for contributing a beautiful design to A Year of Techniques! JAC: I'm interested in people's learning processes... What was the last knitting technique you learned, and how did you go about mastering it? RH: I think the last one I learned was German short rows. I LOVE them! It was a pretty quick learn because there are so many great videos, but then I wanted to experiment with them in different stitch patterns to find out where they look best. I played with lace, plain stockinette, and textured fabrics. I love them best in plain stockinette, including larger stockinette areas of lace. I'm teaching them now, and it's so much fun to watch people realize how simple and magical they are! JAC: Will you tell us a little bit about your 7 reSizeable Shawls project that you’re running this year? It sounds like a great way to enhance your understanding of shawl construction - and to learn some new techniques (we can’t get enough of that round here!!). RH: I can blather on WAY too long about my new eBook subscription! 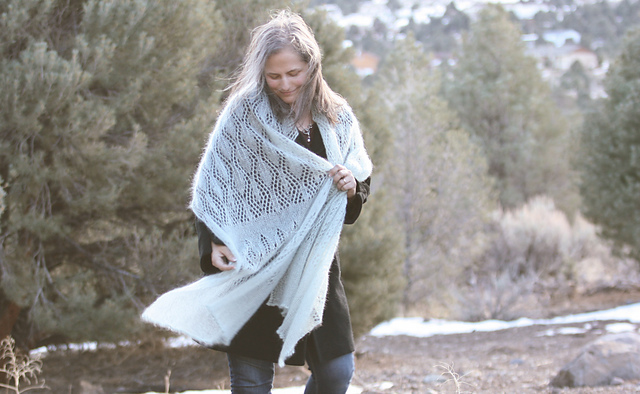 It's a subscription series like my earlier small shawls eBook subscriptions, but with a twist. Each full-sized shawl is written to be resizable and also written so that the knitter can choose the weight of yarn to use. It has two parts: a shawl booklet and a workbook. You can purchase either or both as a bundle. Each resizable shawl appearing in the shawl eBook will have a corresponding section in the workbook. The workbook itself presents techniques and construction used in each shawl (but does not include the full size shawl instructions), as well as a small practice project and a miniature shawl. Each eBook is available as a stand-alone or you can purchase the two together as a bundle. The shawl eBook will have 7 resizable shawl patterns; the workbook will have the techniques used in the shawl eBook plus 14 small patterns (one accessory + a miniature doll-sized shawl that corresponds to each of the large shawls in the sister eBook). Either book can be used without the other. I do write quite a few resizable shawl patterns, but as I stood there in class going through each one of the patterns in the five years of eBooks, the idea for 7 reSizable Shawls was born! And that means you will be able to resize each pattern in the new 7 reSizable Shawl eBook to your heart’s content! Have twice the yardage? No problem! Want to use another weight of yarn? Sure! I also knew I wanted to give people the option for more instruction on the techniques used in my shawls, and maybe a small project to try first. That would make for a pretty lengthy eBook if it were all together, so I decided to split them. Enter the 7 reSizable Shawls Workbook! If you’re completely happy just having the resizable shawls eBook, you can purchase only that. If you like playing with different techniques, the workbook is for you! JAC: If people have enjoyed doing the knitted on edging on Talmadge, can you recommend a couple more of your designs that use this method? JAC: That's a really amazing selection of gorgeous designs Romi! Are there any knitting techniques that you really don’t enjoy? And if so, why? RH: This was a difficult one! I haven't really met anything I hate, just techniques I like better than others. :) I guess I don't really enjoy intarsia, but only because I dislike wrangling all the different yarns. Otherwise, it's a pretty cool technique! I still have MANY techniques to learn, and A Year of Techniques has really inspired me to search them out and conquer them! Thank you so much for taking the time out of your busy schedule to answer my questions Romi! 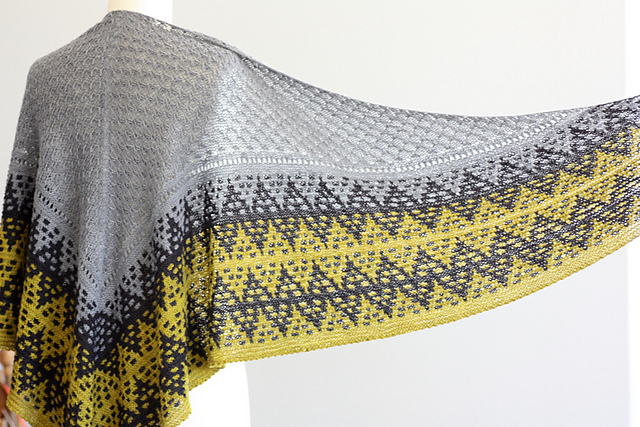 Romi has very kindly donated a copy of her 7 reSizeable Shawls eBook/Workbook bundle for one lucky blog reader! To enter the giveaway, you need to leave a comment on this blog post (with your email address in the appropriate box when you submit your comment so that we can contact you! ), telling us what was the last knitting technique you learned, and how you got on with it (was it easy, hard, how did you master it? I'm really interested in the learning process). One entry per person (international entries are welcome), and comments will be closed at midnight (BST) on Wednesday 5th July 2017. The winner will be chosen at random and announced on the blog by Wednesday 12th July. Edited to add that the announcement was delayed as life got busy, but it's been posted on Tuesday 8th August.